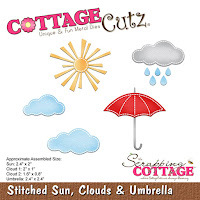 Today, I am using the new Stitched Alphabet, Stitched Owl and Bird and the Stitched Sun, Clouds and Umbrella dies to create a birthday card for a little girl. So let's get started with some details on how I created my card. Step 1: Since I was creating an outdoor scene, I started by sponging my cardstock with distress inks. I used tumbled glass and mowed green lawn on distress ink cardstock. I sprayed the panel with a mister to move the ink around a bit and get a more muted look. I used my heat tool to speed up the drying process. I like the water spots and how the ink splattered a bit in the comer of the card. Step 2: I started cutting my images. Bird: cucumber crush cardstock for the body and pacific point cardstock for the wing. 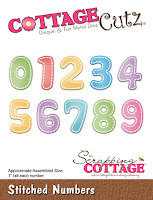 Sun: I cut this out intending to use it in the corner of my card. When I started assembly, I forgot I had it and put the bird image up to high on the panel (LOL)!!! Tree Branch: cut in brown sugar cardstock and the leaves are cut in garden green cardstock. HB2U: cut in cucumber crush cardstock.. I just love the look of the stitched letters. Step 3: Now that all the images are cut, I am ready to start card assembly. 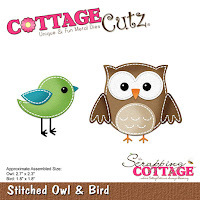 I think this little stitched bird is just to cute. She could be used for a variety of occasions, but today I am using for a birthday card. Step 4: I finished off my card by stamping the sentiment directly on the cloud. I thought it added interest and didn't interfere with my sponged background. Used my MISTI for placement and also to insure I would get a good stamped image. I wanted to add some enamel dots but I didn't have any in the cucumber color. So I cut some small circles and used those on the card. I secured the image panel to the card base to complete this card. Cucumber Card Base: 4 1/4" x 5 1/2"
Well, that's it for me for this post. 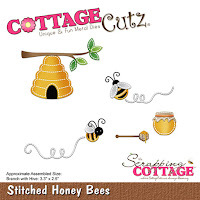 I hope I have given you an idea for the new stitched dies. Here is a link to another card I created in different colors using these same dies. See you next Saturday. Super cute card! The scene you created is adorable with the pretty background! I'm loving the stitched the dies! Love the background for your sweet bird! Great spring card! Such a cute card with that sweet birdie! And I like the way you used the alphabet die-cuts. This card is so lovely. It's great how you combined all the different dies. It's such a cute card, Mary! Beautiful card Mary! I'm really loving those stitched dies!